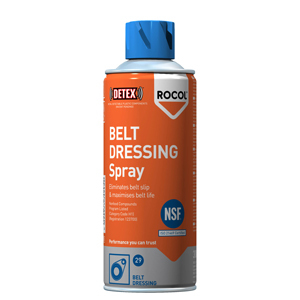 The Rocol Belt Dressing Spray is part of the Rocol's Frontline range, these are the most widely used products and cover a full circle of lubricants used in various industries. Colourless, adhesive spray for the efficient treatment of most belt types. Non - toxic adhesive spray conditions belts to prevent drying out and adheres strongly to any belt material giving instant grip. Non - toxic, colourless, tacky belt maintenance lubricant. Prolongs the life of worn and glazed belts and prevents slipping. For use on all types of drive and conveyor belts.